We hear a lot about globalization these days. People exchange ideas, perspectives, products, and other aspects of their culture. It is exciting and promising to imagine a world in which everyone is learning from everyone else and improving the way they do things. However, there is nothing really new about globalization and there is a negative side to it as well as a positive side. Globalization is a process that has speeded up in recent years for various reasons. However, we can find the roots of today’s globalization far back in the past. 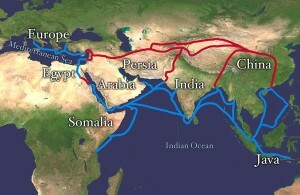 The ancient Silk Road can be understood as a symbol of globalization, linking east and west. 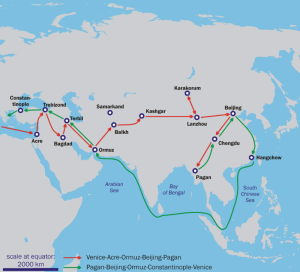 Trade began along this trading route over two thousand years ago and the various forms of cultural exchange that took place had a huge impact on the development of civilization. There is a sense in which the history of humanity is the history of cultural exchange. 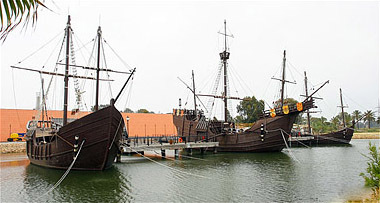 From the European perspective, the Age of Discovery was a time when globalization became more rapid. It began with the Portuguese discoveries along the coast of Africa from the early fifteenth century, then the Spanish discoveries of the American continent, the New World. This period is seen not only as a time of incredible cultural exchange, but also a time when our way of thinking became modern. However, as well as great wonders, there were also unbelievable horrors taking place during this period of change. From the perspective of the natives in the New World, the arrival of these European adventurers was an unimaginable disaster, bringing appalling disease and hardship. However, some people were able to make incredible fortunes and the pace of globalization picked up with each technological advance. Advances in transport technology, such as the steam locomotive and the steamship, made the world smaller and changed the way we thought about the world. Photo. 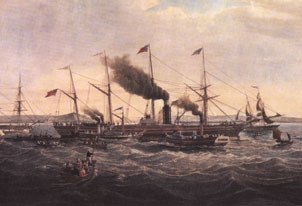 Improvements in transportation, such as the steam locomotive, the steamship, and later the jet engine shrank the world. 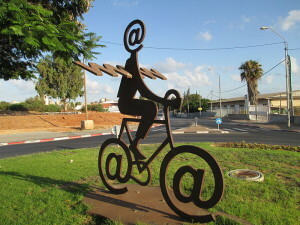 Improvements in telecommunications, such as the telegraph, the development of the internet, and the spread of mobile phones have revolutionized the way we think about time and distance to the point where they can seem to be of no importance. However, how much of this is real and how much of it is illusion? Are we really connected to the rest of the world or have we become more detached in some strange way? 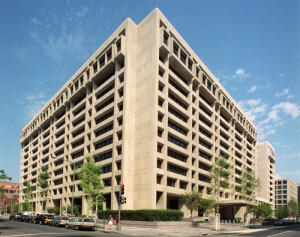 In 2000, the International Monetary Fund identified four basic aspects of globalization. These are trade and transactions (movement of things), capital and investments (movement of money), migration (movement of people), and the dissemination of knowledge (movement of ideas). Can you think of good and bad aspects related to making these four forms of movement more efficient? In the age of the internet, as we come into closer and closer contact with each other, some people believe that cross-cultural competence (3C) is becoming more important. 3C (also known as intercultural competence) is regarded as the ability to communicate effectively and appropriately with people from other cultures. There is a lot of disagreement regarding what this actually means, but there do seem to be some areas of basic agreement. For example, you probably have to have a pretty good understanding of your own culture before you can really understand the culture of others. Even so, you should probably have a good understanding of the culture you are dealing with. Also, you should be fairly open to understanding the feelings and needs of others. In addition, you should have a good, honest, common-sense understanding of yourself, your desires, strengths, weaknesses, and feelings. What do you think? Will a good, honest attempt to understand these things be enough to produce good cross-cultural communication?